Diabetic retinopathy results from damage to blood vessels in the retina (the light-sensitive tissue lining the back of the eye) as a result of improper storage of blood sugar in the body, also known as diabetes. Individuals with either Type 1 or Type 2 diabetes may develop diabetic retinopathy. Diabetic retinopathy is a leading cause of blindness in American adults and early detection and management is critical to preventing severe vision loss. If you have Type 1 or Type 2 diabetes and are experiencing any of the symptoms described here, we recommend that you contact the doctors at Retina Macula Specialists of Miami for an evaluation. While there is no cure for diabetic retinopathy, our doctors can provide you with effective treatment options that can preserve and, in some cases, improve your vision. 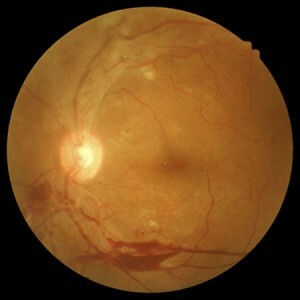 Non-proliferative diabetic retinopathy (NPDR), at its early stages, leads to damage of the tiny blood vessels in the central portion of the retina. When the damage remains undetected, these blood vessels can leak blood, fluid or fatty material and cause visual loss. NPDR is the most common type of diabetic retinopathy. Left untreated, NPDR can lead to Diabetic Macular Edema (DME), which is swelling of the macula, the small area at the center of the retina that is crucial for clear vision. Macular ischemia may also develop when blood vessels in the macula become closed and deprive the macula of the blood supply it needs to function properly. Both DME and macular ischemia can result in vision loss, the latter being irreparable. Proliferative diabetic retinopathy (PDR) is the more severe stage of diabetic retinopathy. During this stage, the body triggers the growth of abnormal blood vessels as a response to oxygen deprivation in the retina. Unfortunately, these blood vessels are fragile and bleed into the vitreous gel that fills the inside of the eye, thus resulting in severe vision loss. Scar tissue may also develop causing a tractional retinal detachment, and in some cases, permanent loss of vision. The doctors at Retina Macula Specialists of Miami will determine the type and severity of disease and the best treatment option for you. While diabetic retinopathy cannot be cured, several treatment options are available that focus on slowing or halting the progression of the disease and, in some cases, improving vision. Injecting anti-VEGF and/or steroid drugs into the eye helps to decrease and control the VEGF and inflammatory cytokine levels in the retinal microenvironment and thereby reduces leakage from damaged blood vessels in the retina. Injectable medications are now the standard of care in the treatment of DME and may often be combined with laser therapy for best results. Laser therapy involves the use of laser energy to either seal off the leaking blood vessels or cause abnormal blood vessels to shrink. Laser therapy can also be used to reduce VEGF levels in the retina believed to be responsible for abnormal blood vessel formation, growth and leakage. To achieve the best possible results, multiple treatment sessions may be required. Vitrectomy surgery is reserved for patients who have manifestations of proliferative diabetic retinopathy that cannot be treated with laser or injections alone, such as vitreous hemorrhage or retinal detachment. This procedure involves the extraction of the vitreous gel and hemorrhage, and removal of abnormal diabetic blood vessels and scar tissue. The gel is then replaced with fluid, air, gas, or silicone oil, depending on the severity of the diabetic retinopathy. Can Diabetic Retinopathy Cause Blindness? Diabetic retinopathy can lead to severe vision loss and blindness when left untreated. The most important factors in the management of diabetic retinopathy are blood sugar and blood pressure control, eating a healthy diet, and participating in a regular exercise regimen combined with routine eye examinations and effective medical treatments. The key to preventing severe vision impairment is early detection. Please contact our doctors at Retina Macula Specialists of Miami to schedule your diabetic eye examination.